Best music streaming hi-fi system for £8000 | What Hi-Fi? System building needs careful thought so, whether you're replacing or making improvements, we thought we'd offer a little advice. When you’re spending this kind of money on a system, it’s not unreasonable to want it all. Bells, whistles, performance - and then some. But this end of the market is often the preserve of purist kit, where features are stripped back to concentrate on sonic gains. For some, it’s worth it. For others, it’s restrictive. That’s part of what makes this system so appealling. Fully equipped to tackle anything from Bluetooth to headphones to high-res audio, it’s an unusually accommodating set-up that works hard to justify its price tag on every level - not just in the sound it makes. Sitting at the heart of this trio is the Parasound Halo Integrated amplifier, which offers a spec-list unlike most integrated amps at this level. There’s a switchable phono stage, headphone output, tone controls, built-in DAC, more inputs than you could shake a cable at and support for just about every music format going (up to 32-bit/364kHz and DSD 256). And with a peak current output figure of 45 amps, there’s enough grunt here to get good volume levels from just about any speaker you’re likely to hook up. Furthermore, its beautifully judged tonal balance is about as neutral as they come, so you have the ability to mould your system’s sound to your tastes. The amp holds its own with kit even more rareified than this, but we find a good balance in the PMC Twenty5.23 speakers, which are about as discreet and stylish as floorstanders at this price get. We find they work best with small- to medium-sized rooms, but the Parasound allows you the freedom to move up the PMC range if you need to fill a larger space. The 23s have surprising scale and authority for their size though, and complement the amp in their ability to deliver both subtle and larger-scale dynamic shifts with real enthusiasm. They’re tonally well judged, with a low end that’s meaty without being overpowering and a treble that offers plenty of bite. The solidity of these speakers adds some natural warmth to the Parasound’s midrange too, with plenty of nuance, refinement and clarity all round. The PMCs help create a big-sounding system, with excellent stereo imaging that draws an expansive soundstage well beyond the speakers themselves – just keep them away from side walls, and at least 30cm in front of the back wall, for the best results. 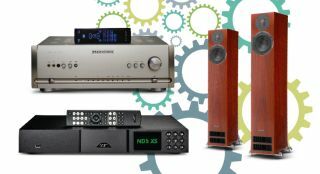 As for your source, you’re spoiled for choice with the Parasound’s plethora of inputs - but we like the Naim ND5 XS streamer both for the way it deals with digital music and the flexibility it offers. It’s kitted out with just about every streaming feature worth having, including Tidal and Spotify Connect, internet radio and aptX Bluetooth - and it's able to sniff out NAS drives and laptops on your network with ease. Feed it a good hi-res track and you’ll really hear this system shine, the Naim capable of digging out excellent levels of detail and insight. It’s an exciting, engaging presentation too, dynamic in its handling of highs and lows, with the ability to go satisfyingly deep while still staying light on its feet. Timing is precise, and the soundstage wide and layered. Bring it all together and the whole system just works, flourishing thanks to its shared strengths and similarly flexible outlook. When you’re spending this much money on a system, you really want an effortless sound. That's exactly what this set-up delivers. Three great products don’t always come together to make a great-sounding system, but in this case they're a match made in hi-fi heaven.